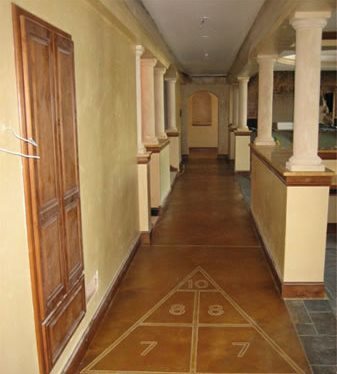 Lonny Mattila of Allstate Decorative Concrete in Cokato, MN recently converted a hallway floor into a shuffleboard court at a clients request in their unfinished basement. The basement was being transformed into an entertainment area with a movie theatre on one side of the 65-foot hallway with a bar and sitting room on the other side. Mattila approached the overlay project by first repairing a few cracks in the floor with TK-9000 Epoxy Crack Filler. He then spread the TK-9000 over the entire floor and sprinkled sand over the epoxy to get a mechanical bond for the overlay. 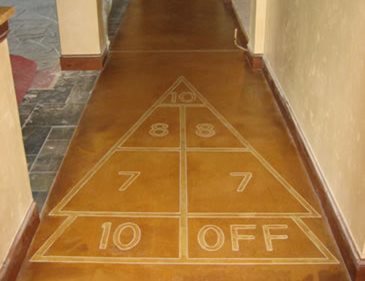 He used Scofields Stainable Overlay, and drew the shuffleboard design in by hand, using a straight edge and stencils for the numbers. He then saw cut the lines and numbers using a diamond wheel on a 4 hand held grinder. The shuffleboard was drawn to scale of a regulation shuffleboard court. Scofields Antique Amber stain was used inside the lines of the shuffleboard. 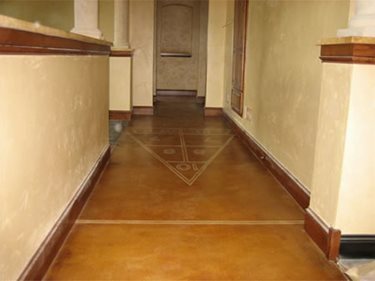 Scofields Terra Cotta Acid Stain was used over the entire hallway floor with an unsanded cream-colored TEC grout. The floor was then sealed with Scofields Select Seal water-based urethane sealer. Mattila finished the floor with 2-coats of a high-endurance industrial floor wax. Allstate Decorative Concrete will travel for large decorative concrete jobs but mainly services central Minnesota including the Minneapolis/St. Paul metro area. Their specialty is custom residential decorative flatwork including, driveways, sidewalks, patios, steps, pool decks, floors, etc of all types of concrete and finishes. They also specialize in stenciled concrete.